The #2minutebeachclean movement was started by a man called Martin Dorey. He started collecting beach litter and used images of what he had collected in a 2 minute beach clean to grow an audience on Instagram. It is an effective way of spreading the work and the movement has grown and grown. There are other movements doing the same thing, but this seems so simple and 2 minutes really isn’t very long. Follow #2minutebeachclean on Instagram and to learn more about it, have a look at their website. Pick it! The idea is that you spend 2 minute during your walk along the beach to collect plastic. Bag it! Dispose of it responsibly. Snap it! Then you photograph it. Tag it! Use the hashtag #2minutebeachclean. Post it! Post it on Instagram to help spread the word and encourage others to help clean our beaches. 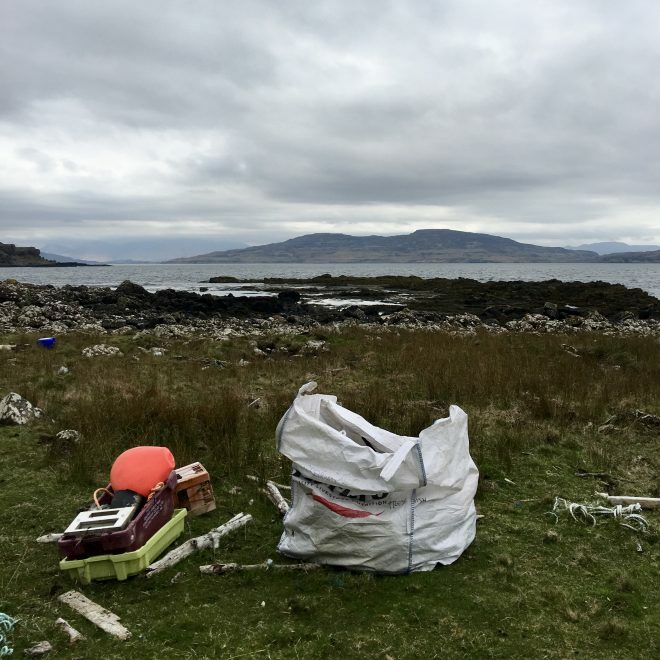 I am being honest when I say that we haven’t always collected ‘bruck’ (to use the Orkney & Shetland word for beach rubbish) when we are walking on the shore here. We might be miles away from home and it is a long way to carry it. And we get overwhelmed by the amount of it. But more often than not we will bring something back with us to a point where Farmer can collect it by quad. Some of our guests amass a pile of bruck, while they are out walking, and leave it where we can collect it by quad bike. This is a great help. Sometimes mystery walkers do the same, leaving a neat pile for us to find. It is always a good feeling to find a surprise pile an unknown beach cleaner has collected. Makes us feel not so alone in the struggle. 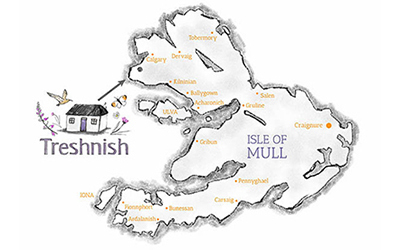 We are lucky to have the help of Mull Otter Group. They come and collect beach litter and plastic from the shoreline beyond Port Haunn. Farmer then collects it each time with the quad bike and trailer. Over the last two years they have collected 7-8 trailer loads of bruck. We have a recycling shed at the farm where you can leave any beach litter you pick up. Or tell us where you have left it and we will bring it back to the farm for you. We will sort it and send it for recycling. Thank you in advance! 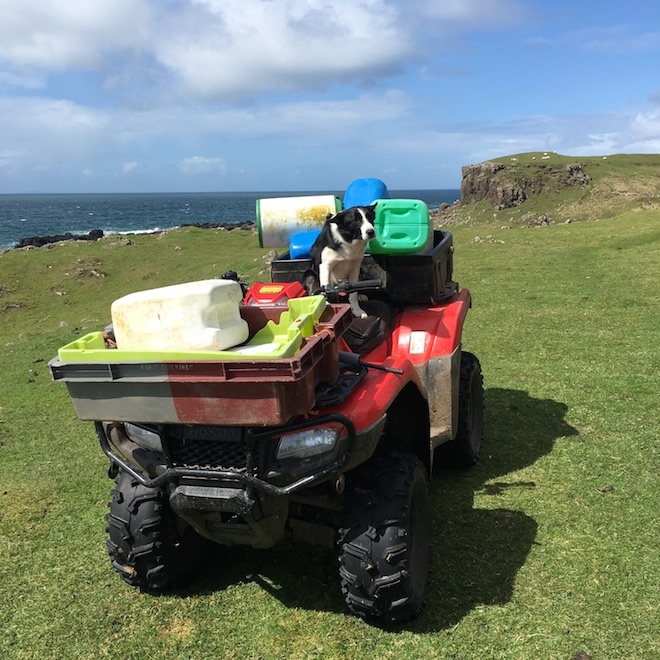 It is lambing time just now and Farmer is out along the coast every day checking the sheep. Sometimes he might find a ewe lambing, and he needs to wait to make sure she and her lamb are okay. What better then, than to do than a #2minutebeachclean while you wait? 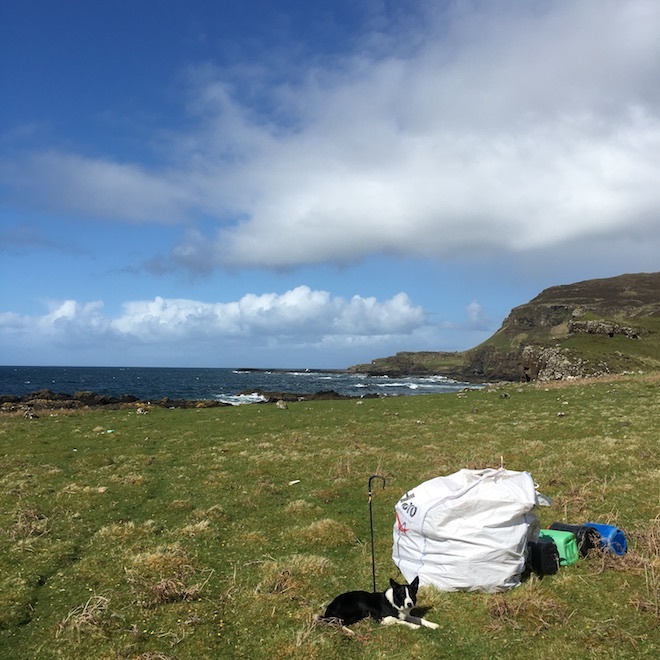 Over the last month or so, along the coast near the Whisky Cave, miles from vehicular access, he has collected 2 huge dumpy bags of plastic rubbish. Amongst the hundreds of plastic drinks bottles, he found the back of a telly yesterday. We now have to find a way of getting the bags to the nearest track. It is a rugged coastline and would be nigh on impossible to get a boat safely ashore. Anyone got a helicopter? We have all seen images of turtles strangled by plastic can loops, but somehow that always seems to be distant from our reality. Today however Farmer brought home a phone pic from his lambing check beyond Port Haunn. I am sorry if you find it distressing. I don’t blame you, it breaks my heart. A young lamb lying dead in a beached lobster creel. It must have crawled in and not been able to get out again. 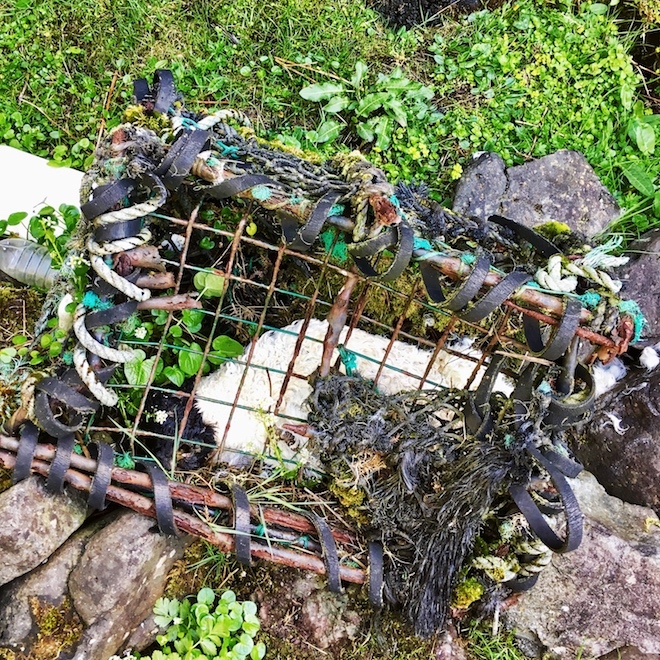 This creel is pretty old – fishermen round here haven’t used ones like this for years. It goes to show that plastic doesn’t just go away, it needs to be removed. One bit of plastic we found recently was a faded pink tag with some letters and words printed on it. I researched it and discovered it was a tag off a lobster pot from Newfoundland dated 1996. Travelled a long way..across the Atlantic ocean, like a lot of the marine litter we are finding. Taken a long time to be noticed and picked up by us here. It is a small world and we need to look after it.